This larger scaled training game is mainly about attracting the opponent on the side to progress into the center through direct passing. From there, the space behind the opponent’s defence can be attacked. The whole field is used. On both sides the 3 mini goals are put on the horizontal line of the penalty box (that is extended towards the sideline): 1 goal in the center and 1 on each end of the line. The area between the penalty boxes is additionally split into 3 vertical zones and crossed by the halfway line. In the middle of the field, there’s an additional zone. It’s as wide as the penalty box and around as long as the diameter of the center circle. Both teams start with 10 outfield players inside of the field. Adding to that, each team has got a goalkeeper that stays inside of the penalty area at first. In the example, one team is set up in a 3-1-4-2-formation while the other one uses a 4-3-3. This can be adjusted according to the individual needs. The game starts with one of both teams, a center back is in possession of the ball. Between the penalty areas, there’s a free game, including all rules like throw-ins. The only special rule is that the ball must be played from one of the outside zones to the box in the center of the field and out again in a controlled manner, before a goal can be scored. This can happen in a variety of ways. You can directly finish in one of the 3 mini goals and will get 1 point for this. Alternatively, you can use the gaps between the mini goals for a through ball to a team mate who attacks the space and can finish 1 versus 1 with the goalkeeper. This, as well as dribbling into the penalty area by yourself, gets your team 2 points. If you score after a chip ball over one of the mini goals and put the ball in the net in the 1 versus 1 with the goalkeeper, you will get 3 points. The line of the box is also the offside line for the attackers. Defenders are only allowed to defend in front of it and cannot enter their penalty box. This training game includes game realistic transitions. After winning the ball, you need to play into the special middle zone from outside, again, before you are allowed to score. The only exception: The ball is won inside this central area and played out cleanly (high risk and high reward of playing through the center). – It must be clearly communicated in which way a player will score (no points by chance, when for example the mini goal is hit accidentally). – Put the mini goals closer towards the halfway line to create a bigger space for playing in behind whilst increasing the pressure inside the playing area. You don’t necessarily need to play through the central zone anymore, but get 1 point less for scoring. Without playing through the center, it’s therefore useless to score in one of the mini goals. – Goalkeeper can be involved in the build-up and pushes to the edge of his penalty box, thus creating a 11 versus 10 inside the field. – If the defending goalkeeper moves out of his goal too early, you can also score in the big goal from outside the penalty box, which is rewarded with one or more points. Here, you need to be careful not to reward hasty shots from bad positions. This depends on the level and characteristics of your team. – Winning the ball in the opponent half: You can score immediately. Although the main focus of the game is on the behavior in possession of the ball, the whole game depends on the defending team. Based on how the latter plays, you can also find further variations throughout the game. It might be necessary to even mainly coach the defence at the beginning of the game. If the pressing is stretched and the defenders don’t cover the path towards the center properly, you can emphasize the importance of covering the most important area on the pitch while defending. Adding to that, you can introduce a pressing trap just there. The passing lines towards the center are deliberately left open to provoke a seemingly safe pass. Once it’s played, the receiver will be attacked from several directions. After winning the ball in the middle, you have a big variety of options on the counter. If the opponent already defends properly, oftentimes tight situations in the center will arise. This happens deliberately through the design of the game, because a certain confidence needs to be developed for playing passes inside from wider areas. This aspected is tested throughout the game. Furthermore, you can also find creative solutions. 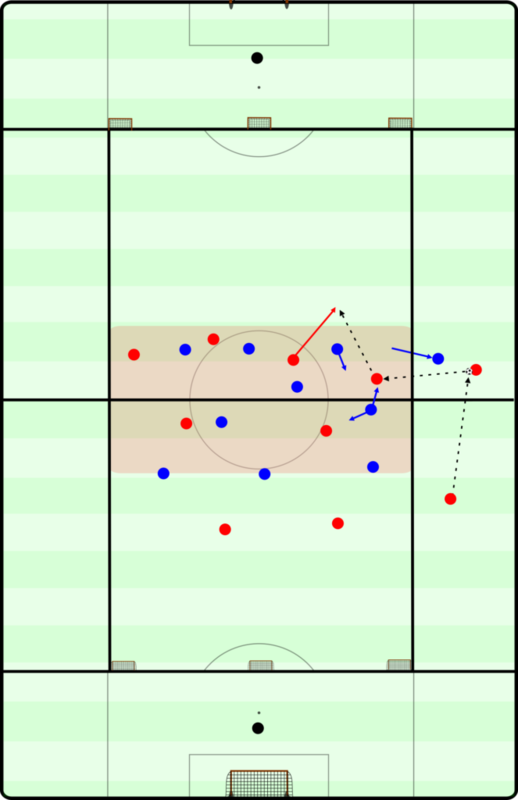 If the central zone is so crowded that a pass doesn’t make any sense, you can for example play past it on the outside to attack the middle from the other half of the field, i.e. ‘backwards’. Only after you have given the players some time to find their own solutions and to adjust to the situation and it’s still to hard for them, you can adjust some of the rules, e.g. you can use the second variation mentioned above. An interesting dynamic develops after you’ve played through the central zone. The team in possession now has a big range of possibilities to score, but it’s mandatory to attack the space in behind. Be it in one way or the other. Starting from the tight space in the center, you need to find a good shift towards the bigger space. In the last third pass communication and timing become even more important. Overall, this results in a complex training game that offers a big range of possible adjustments. These are mainly dependant on your team and other factors.